She began singing as a child but never considered it as a career or received any formal vocal lessons because her parents could not afford them. She took typing and shorthand in high school and thought of becoming a commercial artist or a school teacher. With the urging of friends, she entered a weekly talent contest at the famous Macambo nightclub on the Sunset Strip in Los Angeles. Grant remarked, "Many of the night clubs of the early 1950s were losing business because of a little box they called television that kept people in their homes. So contests were held to try and bring the people out." An orchestra leader at the club directed her to a vocal coach, who worked with her for a very short time. This led to an interview with MCA, a top talent agency based in Los Angeles. When she was asked if she had musical arrangement material and the necessary gowns and other clothing necessities to perform, she told an MCA official that she could not afford it at this time but wished to be considered at a later date if these things became more affordable to her at a later time. Unknowingly, she had been interviewed in another executive's office at MCA and had accidentally left behind a sample recording of her demonstration record, "I'm Yours." When the executive returned from a vacation in Tahiti and heard the recording, he was so impressed that he immediately contacted her and signed her to a contract with MCA. In the early 1950s, she began her career singing under the name Audrey Brown, her married name at the time. With the advice of her manager it was changed to Audrey Grant because he claimed he was a friend of the actor, Cary Grant and it would be good luck. In 1952 she was later signed by RCA Records and Dave Kapp, an executive there, changed it once again to Gogi Grant. He claimed the name came to him in a dream but many who knew Kapp recalled that he frequently dined at a Manhattan restaurant called "Gogi's La Rue." At RCA her first release was "Where's There's Smoke, There's Fire" and it failed to chart as well as subsequent recordings. During this time she sang and entertained in and around Pennsylvania and New York on the Borscht Belt nightclub circuit. In 1955, she moved to Herb Newman's ERA record label, where she recorded "Suddenly There's a Valley." It rose to number nine on the charts. Grant recalled, "There were so many cover versions of "Suddenly There's A Valley" that if I hadn't gone on a 28 city promotional tour in 30 days, I would have probably lost the record." It was written by composer Biff Jones and pianist Chuck Meyer in 1955 to convey the thought that while we crave the excitement of the mountain top, the heights are filled with disappointments, and it's in the serene, settled valleys that earth and man are at peace. They had originally wrote it to be sung by a man, but Grant persuaded ERA to let her record it. Over one million copies were sold despite the fact that such famous recording artists as Jo Stafford and Julius LaRosa also had favorable sales of their recordings and they had been also covered by all the major labels. In 1956, Newman pulled out his manuscript of the song that he and Stan Lebousky had written while they were students at UCLA many years earlier. It was brown with age and had been written in the first person. Newman knowing Grant could not read music asked her to sing the lyric as he hummed it. Grant explained, "There was something special about the song" and she proceeded to change the lyrics to sing from a woman's point of view in the third person. She also mentioned, "There was a country or western trend sound to it and that it would seem attractive to listeners." "Wayward Wind" was recorded in only fifteen minutes in two takes of studio time and five weeks later on June 16, 1956, it knocked Elvis Presley's "Don't Be Cruel" out of the number one chart position. It remained number one until July 28, 1956, when Presley's "I Want You, I Need You, I Love You" replaced it. It also charted at number nine in the United Kingdom. The All Music Book of Hit Singles written by Dave McAleer compiled a list of the top singles of the last fifty years using a formula point system, which took in consideration the record's weekly top 20 position, its peak position and the number of weeks it remained in the top ten and the top 20. "The Wayward Wind" ranks number 36 over tens of thousands of recordings for five decades and it sold over two million records. 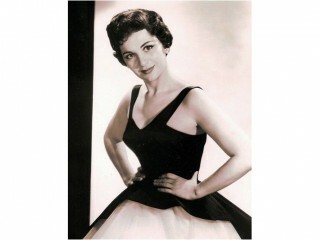 In 1957, Gogi was selected for the singing role in the musical motion picture "The Helen Morgan Story". Although the leading actress Ann Blythe had a lovely voice, it was operatic in nature and musical director Ray Heindorf wanted an original torch type. Grant was heard on the radio and Heindorf hired her on the telephone without an audition over sixty other singers had applied and been heard. Her voice was used to dub over Blythe's and this biographical film of singer Helen Morgan also starred Paul Newman. Her film career also included appearing in musical shorts with country singer Eddy Arnold for Universal Studios. She frequented the nightclub circuit for many years appearing at the Palmer House in Chicago, Ambassador Hotel, the Coconut Grove in Los Angeles and various clubs in Reno, Las Vegas, and other cities both in the United States and overseas. After a 15-year career from 1952 to 1967, Grant took a 20-year absence to raise her two children but returned with rave reviews by the Los Angeles Times and Los Angeles Examiner reflecting that her layoff had no diminished effect on her performance. She has remained an elegant performer. In addition to appearing in sold out shows in and around the Los Angeles area, Grant performs in nightclubs and music halls around the United States including nightclubs in Palm Springs, California. She remains deeply devoted to her children and family. -The Wayward Wind , ERA EL106. -Welcome to My Heart , RCA LPM 1717. -60 Years of Show Tunes , RCA PR100. -Granted It's Gogi , RCA LSP 2000. -Gigi , RCA LPM 1716. -Showboat , RCA LSO 1505. -Helen Morgan Story , RCA LOC 1030. -Gogi Grant , Pete S-1101. -City Girl in the Country , CRC CLM 107. -If You Want to Go to Heaven , Shout, Liberty LRP 3144. -The Best of Gogi Grant , K-Tel. -Torch Time , RCA 43213-86292-7. -The Wayward Wind, the Best of Gogi Grant , ERA 22775-5011-2. -Welcome to My Heart , RCA 74321421262. "When the Tide Is High"
View the full website biography of Gogi Grant .